When explaining what a gluten-free diet means to new friends, I inevitably mention that a strict gluten-free diet has to avoid soy sauces, as most of them are brewed using wheat. So it came as a shock to see an article on Celiac.com that seems to refute that common knowledge. Some of our family members are gluten intolerant, but can consume soy sauce made with wheat without any problems. Although some soy sauces are not wheat free, the gluten seem to be no longer present in the final soy sauce. There are two processes to make soy sauce: chemical hydrolysis and natural fermentation. Both processes will break down the complex proteins including gluten into smaller components such as amino acids and polypeptides. You should only buy naturally fermented (or brewed) soy sauce because of its authenticity and rich taste. Chemically produced (or artificial) soy sauce is used more widely because it is a lot cheaper, but may contain toxic and carcinogenic components produced by hydrochloric acid hydrolysis. Therefore, we only consider naturally brewed soy sauce further in this article. What do soy sauce producers say? And what does Lima Foods, a pioneer in the introduction of naturally fermented soy sauce in Europe, tell about their soy sauce? They don’t say anything about gluten in their Shoyu soy sauce, which is made with wheat, but do mention that their wheat-free soy sauce, Tamari, contains no detectable amount of gluten. We sent a sample of soy sauce of the brands Kikkoman and Lima to an external laboratory to determine gluten levels. In both samples the gluten content was below detection limit of 5ppm (see report). According to a new European legislation, which will only be fully implemented in 2012, gluten-free foodstuffs should contain less than 20 ppm gluten. The FDA also proposes a limit of 20 ppm. This means that our two tested products may be considered as gluten-free soy sauce. The tested naturally fermented soy sauces are gluten-free and will probably not cause adverse reaction in gluten sensitive persons, especially when considering the small daily quantities of soy sauce used. Highly sensitive individuals who want to be 100% sure should use soy sauce which are advertised as gluten-free and which do not contain grains as ingredients. Tamari soy sauces are typically produced without wheat, but some brands do not follow this tradition and are not wheat-free. So what do you make of this news? Did you know it already? Are you optimistically skeptical like I am? Do products (like Omission beer) that are brewed with gluten-ingredients scare you from trying them? I will say that in the land of Asian cuisine, being able to eat dishes cooked with non-tamari soy sauce would open up a lot of opportunities. 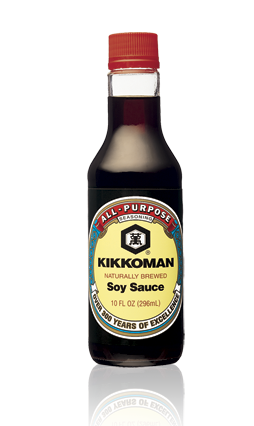 For those that want to steer far clear of those risks, companies like Kikkoman have a specifically gluten-free soy sauce for you. SureFoodsLiving has written to Kikkoman directly in the past, and you can read the the scientifically-based response she received here.